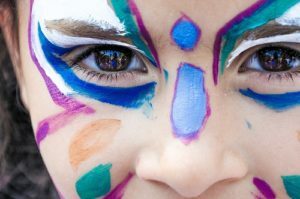 Adults get their faces painted, but you more often than not associate the practice with kids. Kids face paint Perth is a great way to add a little spice to a party. However, there’s a lot of ways that the painter can get it wrong. Here’s a quick look at some of the more common errors that new face painters make. We’ll also offer insights on how to correct them. Our first tip is to stock up on tissues. This might not sound relevant. However, baby wipes are a blessing when you’re trying to correct mistakes or remove a design. Not everyone can roll with the punches and turn a botched stroke into a masterpiece. Using wipes to correct errors is too useful to ignore. Visualize the face. Imagine what it’ll look like when you’re done. This is crucial because it lets you start things off right. You know where to go and how to start, simply by having the final image in your head as you work. However, when doing this, stick with a basic design. Something simple that can get the point across. What you don’t want are flourishes or touches that you can add later, once the foundation is laid out. Value your paints. No matter what design you go with, value them. The paints don’t need to be expensive. However, you do want them to be of professional quality. Don’t settle for something that’s just cheap because you’re only painting for kids. Get the good stuff, the paints that are safe, vibrant, and work best with you. When you want to do a wide area of coverage with a base colour, skip the brush. Use a sponge instead. It’s faster. You might want to invest in multiple sponges, one for each base colour. Think thin. Let the first layers dry before you slap on a second coat. This is because failing to dry the paints means they’ll mix together. This can cause you to need to reset, which wastes time and can try the patience of little kids. You’ll also want to use thin layers, rather than thicker ones. Our final bit of advice? Bring a mirror. You and other people can tell if the painting is good, but you’re not as important as the kid who just had it done. Bring a mirror and show them what you’ve worked on, so they can start enjoying it to its fullest. All of our amazing artists have “Working with Children’s Cards”, Public Liability, lots of experience and a love in what they do, meaning that you have not any need to be concerned whatsoever.